This is the story of a regular guy (as much as a regular guy that an astronaut to Mars can be) who accidentally gets left behind on the red planet and is forced to survive using whatever he’s got. He’s part botanist, part engineer, all MacGyver. He finds a way to create water, warmth, food, energy, mobility, communication and even a reason to continue fighting for life all with options and math that actually worked. It made my nerdy heart happy. It’s what I love about MacGyver too. The unflustered ingenuity in the face of disaster. I wish I had more of that. I am a planner and want to know three steps in advance instead of “make do” with what I have available to me. But I’m learning to do both and to be okay with things don’t go according to plan. 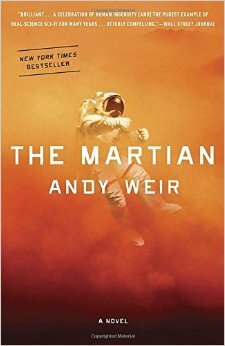 Although I’m not an abandoned astronaut stuck on a far away planet, I could relate to the main character, Mark Watney. I have many tasks to do each day like Watney did and although mine don’t involve manufacturing water or trying not to explode my only habitat with compressed hydrogen, mine too can be mundane and repetitive. There are times when I feel alone and isolated. Watney knew this to a far greater extent than I ever will and he was able to pursue a noble goal and laugh at himself doing it. I have to keep a wide perspective on life and know that what I am fighting for. Watney was striving to get home. I am striving to get Home too, I just don’t have to use a jetpack to do it. Because time is a finite resource, every action involves an infinite amount of non-actions. Every choice I make. What book to read, what movie to watch, what food to eat, what topic to write about, necessarily involves not reading other books, watching other movies, eating other foods or writing about other topics concurrently. I can only perform one at a time. As discussed in my last post, I learned this from an unlikely source, A book titled How to Talk About Books You Haven’t Read by Pierre Bayard. I’ve been thinking about this some more, wanting my choices to be the best possible. I am sometimes swamped with possibilities, invites, offers, requests, and commitments. Everything I say “yes” to involves saying “no” to numerous other possibilities. I say this not to heighten the stakes, leaving me indecisive and ineffective, but to remind myself that time is valuable. It should be used well, thought-through, and intentional. I should be living each day on purpose not thrown into it be default. Am I saying “yes” intentionally to the things that are most important in life? Within reason, am I looking at the options I’m saying “no” to and weighing my options before deciding? Does this thought process excite or terrify me? As I said a few days ago in reference to books and reading, I now exclaim for the rest of life: Every action involves an infinite amount of non-actions. Does this help you in decision making or make you nervous? Every action involves an infinite amount of non-actions. I learned that while reading, somewhat distractedly on a plane and had to turn back and re-read it. 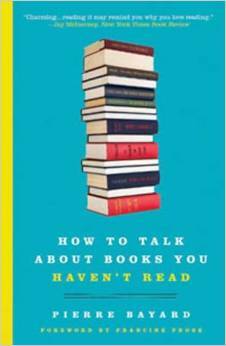 A professor wrote a delightful book entitled How to Talk About Books You Haven’t Read. In it he began by bemoaning his lot in life as a literary professor who could not possibly read all the books he was expected to. Expected by university and students alike to have a working knowledge of all major works since the dawn of recorded time, no one could live up to such reading proficiency. Bayard discusses the benefits of skimming, familiarity, and thematic resonance possible to broaden his base of books from which he can speak intelligently about — even if he hasn’t actually read them. Which made me feel a little bit better. I read fairly extensively, but it seems as I work my way through my list of read books, the list of unread and deserving to be read books lengthens exponentially. Thus in every decision to read, I pick up one book, and I at the same down leave thousand of books unread. Because time is a finite resource, this is true in all areas of life. Every action involves an infinite amount of non-actions. Since when did virality become a desirable thing? 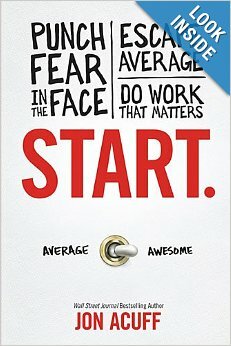 I’m still learning to punch fear in the face, escape average and do work that matters from author, Jon Acuff. Although I didn’t know it at the time, this blog was my big Start project! I stopped thinking of all the things that could go wrong by starting a blog (no readers, lose interest, no talent, pointless posts, hecklers, etc). I punched fear in the face and started. Now I’m dealing with the second part… what comes after the start? How do I keep the drive and momentum after the initial adrenaline of starting has worn off? How do I stay true to the craft and not get sucked into the whirlpools of anxiety by focusing on numbers, followers, subscribers, and virality statistics? I don’t have to worry about numbers, statistics, or virality. I have to write because writers write. I am choosing to focus on content because that’s what I love. I love to share ideas, communicate, craft the perfect post, share my epiphanies, and receive feedback. I don’t love statistics or marketing and now I have the freedom to care about those aspects of blogging a little less. My job is to craft my awesome. Because awesome always goes viral. Punch fear in the face. Those are the collective subtitles of the book Start. I just read by Jon Acuff. You may be familiar with Acuff from a little blog called Stuff Christians Like, where he pokes fun at silly things Christians do, like side hugs and inserting “just” dozens of times into their prayers. He’s an everyday comedian. I secretly want to be his friend. If you tell Kelly to set the table, she’ll go to get the silverware, and she’ll notice crumbs on the countertop. She’ll wipe the countertop and then notice that she knocked some of the crumbs onto the floor and now it needs mopping. Kelly goes to her closet to change– not wanting to enter full cleaning mode in her current clothes. While standing in the closet attempting to find a change of clothes, Kelly begins cleaning out clothes she never wears anyway. She’ll then need to clean out her car to place said clothes to prepare them for donation. Kelly will then need to locate her tax info to for charitable giving purposes. Kelly will then find an unpaid credit card bill in her pile of “important paperwork” and she’ll race to the phone in an attempt to avoid late fees… meanwhile dinner is cold because the table was never set. Acuff encourages me to stop making lists and prioritizing my interests endlessly. He says simply, “Start!” Pick something and go with it. Get out of “If you give a mouse a cookie-land” of half finished tasks and do something. If you feel like you cannot pick a New Year’s Resolution because you want to lose weight and eat healthier and get more sleep and save more money and be a better friend and learn to sew and run a six minute mile and become President… stop fretting, pick a path and Start! Happy New Year! Start something new! What do you plan to start? Car accident. Amputation. Stump. Prosthetist. Cerebral Palsy. Disability. Perseverance. Success. That’s a ten word summary of the best book I’ve read in the recent past. 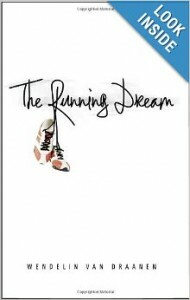 The Running Dream chronicles the story of Jessica, a bright young sprinter who loses her right leg below the knee after a catastrophic car accident. Jessica reluctantly enters the world of doctors, disability, rehab, and feels conspicuous at every turn. She is forced to relearn the simplest of tasks, like getting to the toilet. Upon returning to school, Jessica begins to relate to her peers with disabilities in a new way. She befriends Rosa, a Freshman and math genius with Cerebral Palsy who begins to tutor Jessica. Through her friendship with Rosa, Jessica learns (and understands in a personal way) that everyone wants to be seen for who they are not for their disability. Jessica progresses in rehab, is fit for a walking prosthesis and is able to be fit for a running prosthesis (through the tireless fundraising efforts of her track teammates). Jessica begins training again because she was made to run– it is what she enjoys most in life, something transcendent and nearly indescribable. After describing the joys of running to her new friend, Rosa, Jessica determines to push Rosa in her wheelchair for a ten mile race so that Rosa too can experience the joy of the journey and the wind in her hair. Author Wendelin Van Draanen impacted me on so many levels. I am an occupational therapist and work with children and teens with disabilities just like Rosa’s and Jessica’s. I was impressed with the accuracy of Van Draanen’s depiction of the rehab process. Some of the tips Jessica was given I have shared with some of my patients! Also, I have done research about the place of persons with disabilities and daily seek to see them (and encourage others to see them) as people first who happen to be dealing with a disability. And I am an aspiring runner. I am growing to understand the joys of running, accomplishment, and the magic of the finish line. I enjoyed the emotions that Van Draanen was able to bring into this book: the financial strain of hospital bills, the guilt of survival, the changes in relationships, and the thrill of success. I loved this book. My only edit would be, that had Jessica had occupational therapy as part of her rehab process, she wouldn’t have had to perform a dangerous one-legged hop into the shower in one scene! Truly fabulous read, Wendelin. Thank you for the powerful message. I have a 45 minute commute to work. So I enjoy my car time by listening to stories, by getting lost in another world to and from work. 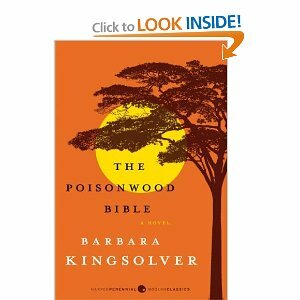 I just finished The Poisonwood Bible by Barbara Kingsolver. It tells the story of one family’s journey in, with, and through their crucible in Africa in the 1960’s in their own words. Each chapter is written in the first person and has the voice of the wife or one of the four daughters of the infamous Nathan Price. 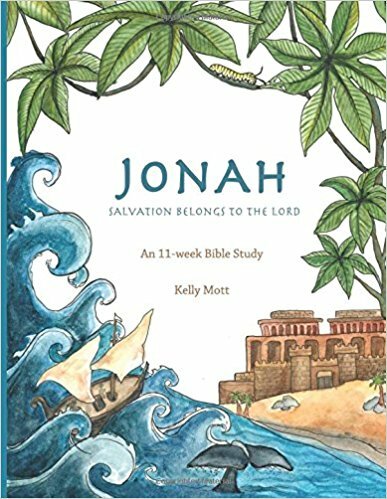 Nathan takes his family to the Congo for what he believes to be his calling from the Lord. The family goes through cultural faux pas, miscommunication, famine, political revolution, disease, hunger, and death over the next several years. They are scattered, literally, to the ends of the earth. It is not a happy bedtime story. One character, Adah, was born with hemiplegia and, because of difficulty and because she is not readily listened to, she keeps her verbal words to a minimum. Instead, she writes. She is constantly writing poetry, tales, and her own story throughout the decades that this book spans. At one point she writes the following quote, which if I were reading this novel I would have read over and over again. Instead, I missed half of her next paragraph repeating it in my head to ensure retention. I loved that. I understand that. Writing helps me know what I think about something. When trying to explain myself or make a decision or prepare for a talk, I must write down the noise in my head, clamp it to the page, in order to keep it still and look at it logically and know what I think. The quote was beautiful and it makes me want to clamp down my words even more! I should’ve seen it coming. It IS in the title after all! 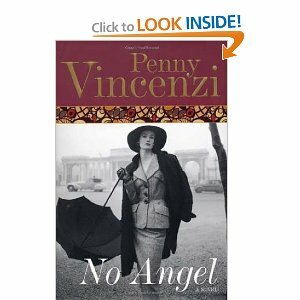 No Angel, by Penny Vincenzi is a historical, family drama set in and around World War I. Celia Lytton, the protagonist is a gifted book editor and publishing guru along with her husband, Oliver. This novel follows Celia and her near, extended, and adopted family members through a few decades of drama. I very much enjoyed how this story interacted with historical events. For instance, the family is set to take a trip on the Titanic before one of the children becomes ill delaying the trip and saving numerous lives in the process! I am a fairly fast reader and I tend to skip some details. 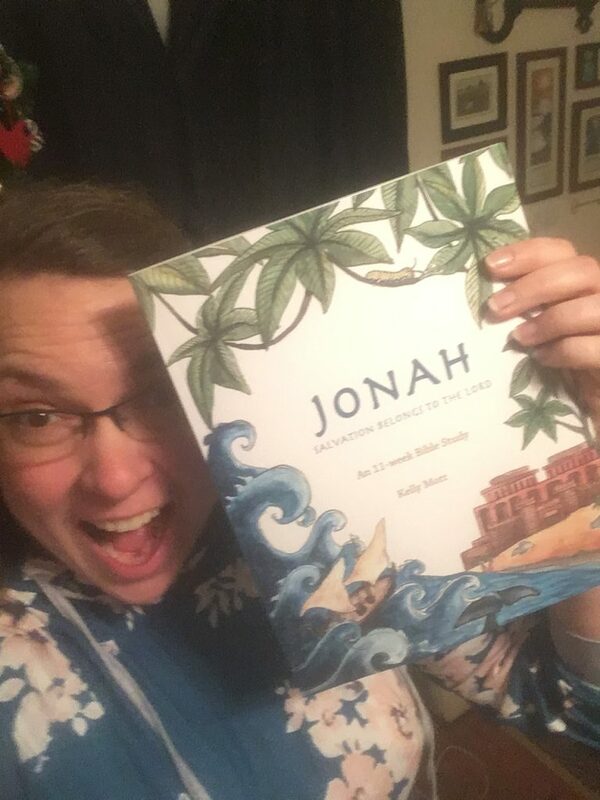 I’ve been known to read and think in my head, “That person’s name is the long one that starts with A.” Reading like that doesn’t cut it in this book because there are oodles of characters – family members, friends, significant others, authors! I had to flip back pages a few times to catch myself up on some plot lines. If you can keep names and relationships straight, read on! If you get confused during Green Eggs and Ham, perhaps not! The title is telling. Celia is no angel. She struggles in life. She wants more, is enraged how WWI affected her life and family, wants to succeed at work, wants to care for her children, and she wants to feel loved. She makes some blunders – both personally and professionally. And she has to live with those consequences. I appreciate Vincenzi’s writing ability here. She can both help me to identify with the desires with drown Celia, but she doesn’t live or write in a rose-colored world where love always wins and no one gets hurt. Celia is no angel, but somehow you cheer for her anyway. Middle-age. Middle management. Mid-life crisis. Middle child. Middle school. Middle doesn’t have that good a reputation. Beginnings and endings get all the glory, excitement and recognition. But the middle is often overlooked. Which is disheartening because it is where most of the work is done. Middle is about perseverance. About fortitude. About forging steadily onward no matter the obstacles in your path. 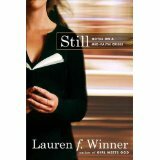 Author Lauren Winner discusses the trials of middle in her book, Still, Thoughts on a Mid-Faith Crisis. This book, a collection of disjointed essays portrays the feeling of middle. The stagnant, stillness of the mundane, the everyday. The feeling of dragging through life. She relates her experiences of middle to her marriage. But she doesn’t pull punches or wear rose colored glasses. Winner does not try to portray herself as perfect. In fact, she is far more focused on her own sin than anyone else’s. She is open about her sin and shortcomings, even when it’s painful. She talks about how her marriage started – and how it ended. She discusses the weight of her unhappiness and the wrestling with theology – in which Jesus is clear about his thoughts about divorce. She writes about how she felt through it all. Winner is a poet. She can see lessons in everything in life from coffee with a friend, to visiting Emily Dickenson’s house. There is no plot in his reflective novel and Winner is clear that it is not a memoir because of its lack of narrative. But through her essays, you are journeying with Winner through her middle. Through her crisis of faith. Through her desire to have hope and worship again. In that way, it is haunting as I can see myself having similar stages in my Christian journey. I am knowledgeable. I have a Master’s degree in theology. I’ve been at this Christian thing for some time. Am I getting bored? Is that the reason for the spiritual funk in which I find myself? Winner doesn’t give her readers a conclusion. She wants them to wrestle with their middles. I’m wrestling with mine. I’m in the middle.